Sounds like most of us in the Midwest might have gotten some nasty weather last night. We had tornado warnings for our area but thankfully nothing ever touched down. Instead we got some much needed rain, maybe a little too much though in such a short amount of time. Our youngest was a little scared and they were all up later than normal because of the storms, so I'm letting them sleep in a bit this morning. 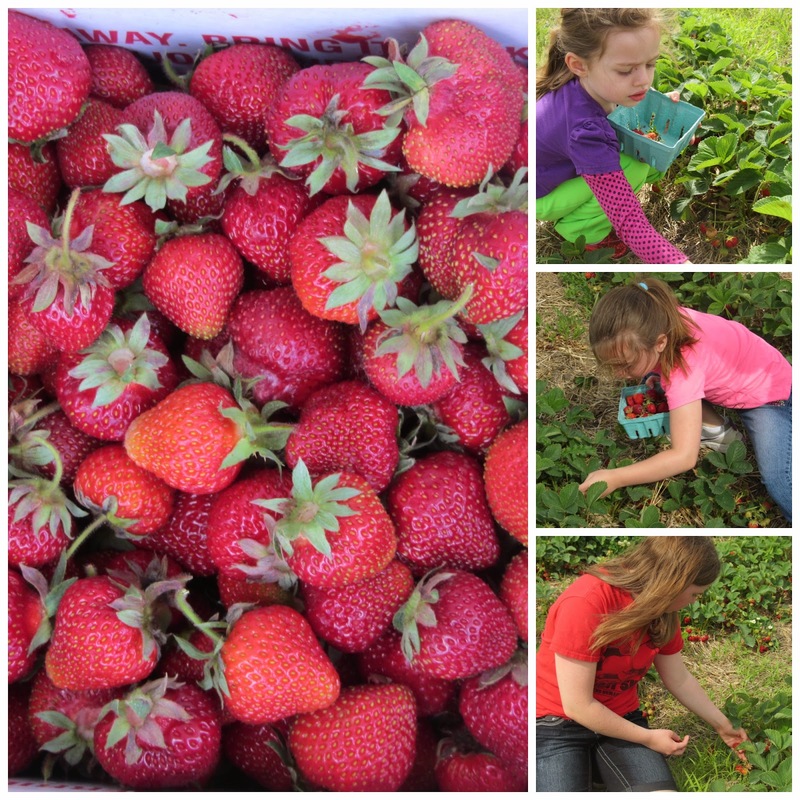 Last week we trekked out to our favorite local strawberry farm and did our annual picking. It was beautiful that morning we went; sun was shining and there was a breeze going so we were not hot by any means. With the girls having their dance performances all weekend long I only wanted to get one box, I'd hate for them to spoil before I had time to process them all. So we ended up with about 10 lbs. of berries for our first picking. We'll head out either tomorrow or Thursday and try to get another twenty pounds so I can fill our freezer with jam and sliced berries to use throughout the winter. The contents of our first box seems to be diminishing quickly. The girls are going to the fridge and grabbing a handful of berries to snack on frequently. But I did manage to get this salsa made last night. The hubby gave me a funny look when I pulled out strawberries, a cucumber, cilantro and a jalapeno and set them out on the counter. I promised him it would be good. It might seem like a strange concoction but I swear it's really good! I let the flavors meld together overnight before I tried taking a picture this morning. My berries are also so ripe and juicy, hence why everything looks red in the bowl. The berries of course offer a sweetness to the salsa, but I love how the jalapeno and cilantro counter that so it's not too sweet. I didn't add any of the jalapeno seeds to my batch just because I didn't want the kiddos to think it was too hot. It's very mild, but if you'd like some kick make sure to add a few of those in. I love this time of year and making salsa, it's a favorite snack of ours or when it's simply too hot we can even make a meal out of it. I think this would also be great served on top of grilled chicken or fish. That might be something I need to try soon. Add all ingredients to a medium sized bowl and combine well. Season with a little bit of salt if desired. Serve with your favorite tortilla chips. Did you catch my newest giveaway from last Friday? Make sure to enter, one lucky person will win an ultimate summer grilling package, it contains some awesome prizes, including $50 in free pork coupons which are good at any local grocery store. Perfect for all of those summer barbecues!